A wise woman once described long draw as the funnest of draws. (Okay, it was me, last week, but I was feeling wise at the time.) My first time, it was almost like the yarn spun itself, but then I was spinning some Rideau Arcott wool that my mum had carded and given to me with the wheel. I had no idea how lucky I was. Now, if I could, I would have my mum living right next door so I could bribe her with knitting to prep all my spinning fibre for me. That lady knows her stuff. 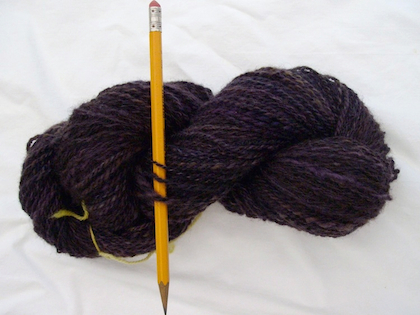 The next time I tried long draw it was with some commercial roving, and admittedly it was not the ideal staple length for this technique, either — around 4-5″ rather than >3″. Suddenly it was the scariest of draws, and the hardest, and probably the cussiest. This rather sad attempt led to language that would make a sailor turn away and cross himself. It seems that the ideal fibre for long draw is stuff you’ve lovingly carded yourself (or, if you’re as lucky as I am, your sainted Mum has lovingly carded) and formed into neat rolags. Possibly on a tray, set within reach, beautifully lined up and awaiting your skilled fingers. 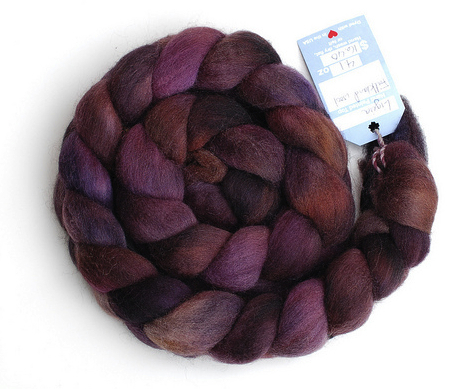 As it turns out, though, long draw or can be done with fibre that doesn’t meet this ideal. Thank goodness, because I haven’t yet fallen down the (undoubtedly wonderful) rabbit hole that is prepping your own fibre, and won’t until some hand cards magically appear in the house. Or until I buy them. Which may be soon. In the meantime, I’m stuck with commercial prep, which is mostly combed top: ideal for smooth, worsted yarns, not so great for woolen, at least for this n00b. For instance, I had this beautiful combed Falkland top from Cloudlover that I was sure wanted to be a fluffy worsted yarn. Mmmm....purple... Photo by Karen Terry, from whose destash I scored this braid. It’s top, though. Combed, not carded, with a staple length over 3″ (I think it was 4 or 5″). Exactly what you shouldn’t do long draw with, or so I thought. However, some spinning geniuses (genii? More than one genius.) have figured out how to spin this stuff woolen (which is what long draw does), and for that may flights of angels sing them lullabies on a nightly basis. This guy, for instance, has very kindly done a video on making and spinning fauxlags from combed top. Despite my impeccable lining-up-on-a-tray technique, my foray into fauxlags did not quite work out like this, though, so I’ve saved this video to try again later. Not perfectly even, but acceptable, no? 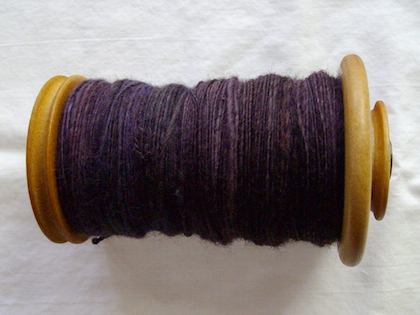 The second bobbin filled just as quickly, and the whole thing plied up into 220 yds of somewhat fluffy, purply goodness. Finished! 206 yds/ 3.9 oz. Not perfect, but if I wanted mill spun yarn I could buy it. If it helps, think of it as a particularly rigorous spa treatment. This is some soft, fluffy, Aran weight-ish yarn. I think it will feel wonderful around the neck on a cold day, maybe as Maryse Roudier’s Very Braidy Cowl. I blows me away that you can do this! What results! Impressive. Thanks, Kristin! You should see what people who’ve been spinning for a long time can do. Just amazing.